Oh hai. Were you holding your breath, in trembling anticipation of a blog post? For, like, evar???? I sorry. Blog was broke, but will blog now (also pleez pardon lolcat silleez. Iz adikshun!!). But srsly, as many of you know, one of my grand adventures this summer was traveling to Switzerland to record with Michael Stillwater. The recording was done at a big pro studio called PowerPlay, located in a charming little town outside Zurich called Maur. That was back in July, and I’ve just gotten word from Michael that the CD, which is called “The Honoring,” has been released online. The entire album or individual songs can be downloaded from the site. Song clips are also available for your sampling pleasure. If you click on individual song titles, you can find out which ones include my vocal tracks. “The Honoring” is a collection of spontaneous songs created by Michael in his Honoring Ceremony sessions, in some cases embellished with additional instrumentation and/or my vocals. The original live recordings used as the base tracks for the album were chosen from the hundreds of songs Michael has collected over the years. In each, Michael is doing his lovely work of improvising a song at the request of a session participant. Based on what the person asks for and Michael’s intuition and connection to Source, a song is born on the spot, crafted with loving care in the moment for that person. If you’d like to hear more of my vocals with Michael, check out Feels Like Home, a very cool chant-style song we recorded in 2006. My vocals are also heard on Michael’s live CD O Great Spirit, which is a recording of a Chantwave concert at The Center for Spiritual Living a couple years ago. Hope u enjoyz da musik! 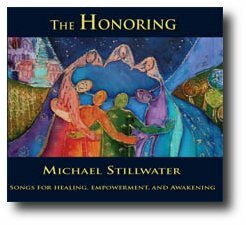 Michael Stillwater, recording artist and music healer (amongst many other amazing gifts), has released a recording, “O Great Spirit,” from his November 2, 2007 Chantwave concert at The Center for Spiritual Living in Seattle. I had the oh-so-yummy pleasure of joining Michael on stage for this show, as did friends Erin Mcgaughan, Sean Bendickson, and Rick Bakken. All my music-making with Michael, whether live or in recording sessions, has been loose and flowing, and the evening of this recording was no exception. This is not a rehearsed set. As musicians supporting Michael, we take in the feel of the song in the moment and contribute whatever feels juicy vocally and instrumentally. In some cases, we’re doing a song we’ve never heard before. Working this way is something that I love and at the same time pushes my boundaries and scares the poop out of me. There is no safety net. There is all the room in the world for weirdness, and also the most sublime harmonic moments. Michael is teaching me about letting go of judgment of the voice, stretching and taking risks. He himself makes up songs for people–on the spot–for healing and connection to Spirit. Talk about trusting in the Divine Flow! I’m grateful for his modeling that deep trust, as well as his treasured friendship. Through his example, I’m getting to a deepening sense of trust in my own ability to tap into that divine energy of inspiration. O Great Spirit is available for download here. Listening samples are also available. Be sure to check out Michael’s other recordings while you’re visiting his site, Inner Harmony, and I certainly recommend seeing him live if you get the chance. Hey, you never know, I might be up there singing, too. Michael Stillwater, musical healer, songrwriter, interfaith minister, and recording artist, has invited me to provide supporting vocals at a number of his events in the Seattle area in October/November. I’m so excited I can hardly stand myself, even though I just got back from Seattle (and caught an awful cold while I was up there). The music directors for both Seattle Unity and The Center for Spiritual Living also asked me to sing at their services while I’m in town, so it will be a wonderful week of music and renewing friendships. I’ve got all the performance dates listed on my Music page. I’ve also added some new songs to the page for you to listen to, including a sample of Michael’s new song “Feels Like Home,” which will be released on his upcoming album. I did all the female vocals for that song, which was great fun. We’ll be doing more recording for his new album when I’m in Seattle.